Big Poppa's Double Secret Steak Rub is the secret ingredient your steak has been missing. 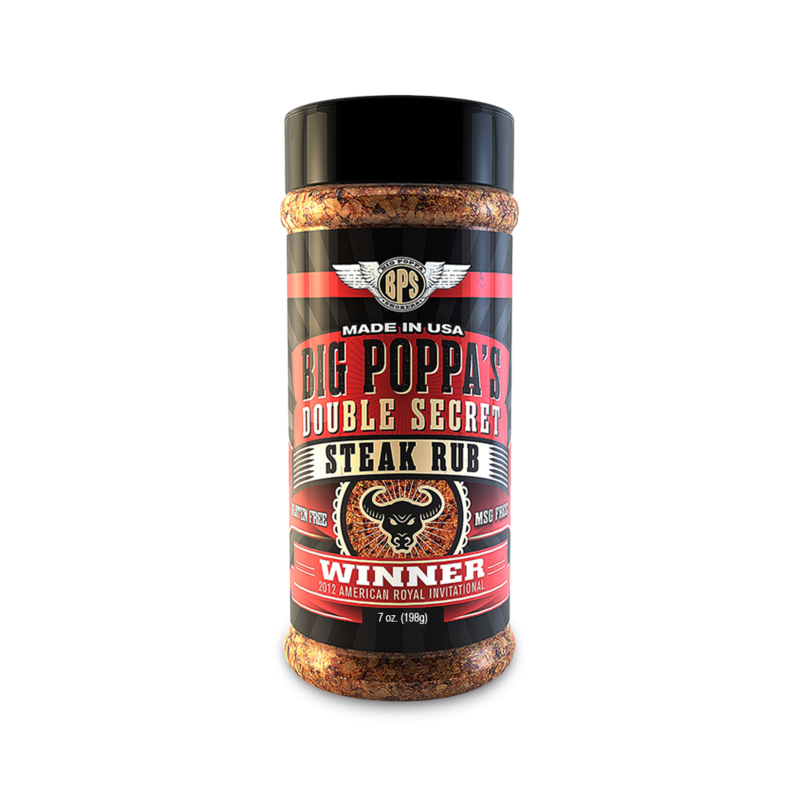 This BBQ rub has been specially formulated to bring out the best flavors in any cut of steak (tri-tip, ribeye, filet mignon, etc. ), and it also brings out the best flavor is just about anything beef. It's even great on baked potatoes and other sides. The secret behind this blend of spices is the large course sea salt. The blend of spices with quality sea salt compliments the natural flavor of beef creating an irresistably delicious cut of meat. Barbecue pro's and backyard BBQ enthusiast can't get enough of this secret rub. Double Secret Rub fanatics have even started using this rub in the kitchen as an all-purpose seasoning. Not convinced? BJ's Brewhouse & Restaurants, a national restaurant chain, has picked Big Poppa's Double Secret Steak rub as their exclusive steak seasoning. Ingredients: Sea Salt, dehydrated garlic, onion, bell pepper and lemon, spices, sugar, brown sugar, paprika (color), citric acid, celery powder, turmeric (color), natural flavors, extractives of paprika (color), and not more than 2% of tricalcium phosphate to prevent caking. Double Secret is wonderful for brisket and second to none on steaks. I have cooked a lot of tri tip but used for the first time BP Double Secret and BP Little Louise. That made for a GREAT combo on tri tip. I tried this on some Buffalo burgers and they were in the top 5 burgers of my life. I haven't tried it on a steak yet, but I am certain it will be amazing. Every BP rub I've tried has been amazing. Thankfully, I still have a few I haven't tried yet from my first shipment.